When you are analyzing the stock there are two ways to do that, either by fundamental analysis or technical analysis. Fundamental stock analysis are mainly performed by gathering information related to company, its operations, its businesses, its profit and loss, etc. whereas Technical stock analysis is performed by evaluation stock charts, indicators, etc. Many times you might have heard from stock brokers or market traders saying that company is strongly recommended as it has strong fundamentals. But you never know how the analysis was done. 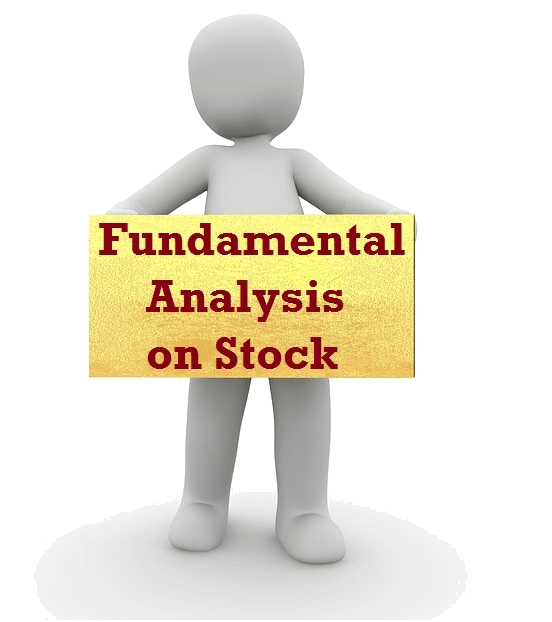 When discussing about fundamental stock analysis, we will understand how and what are the correct ways followed by analyst. Also it will assist you to perform self-analysis to pick a stocks of a good company. Basic fundamental stock analysis is very simple. The important factor for analysis is finding the company’s intrinsic value. Which means finding whether the trading stock price is really worth to buy a stock or whether it is overvalued. If intrinsic value is greater than current traded price, which means stock is trading at undervalue and it is recommended to buy a stock of that company. There are various different method to evaluate intrinsic value of the stock. One of the recommended way is by studying discounted cash flow statement of the company. When analyzing the stock, this statement will assist you in identifying whether the future profit are really on discounted or not. For example: the external factors or companies growth strategy forecast that company has the potential to earn $500,000 per year where currently earning $200,000 per year. Let’s say company XYZ forecast that for first five years they will grow at the rate of 20% and thereafter from sixth year they will grow at the rate of 10%. In this scenario, we will add five years cash flow to evaluate the present value of the stock. After that we will evaluate the cash flow statement after sixth year with the assumption that company will make profit of 10% thereon. There after we will evaluate the discounted cash flow from all this year and then comparing with the present value of the company stock. If estimated value of the company is greater than the current market price then it is recommended to buy the stock of that company. Vice versa, if the future value is lesser than the present value then fundamental analyst will not indicate buyers to jump in that company stocks. Fundamental analyst evaluate current stock price with the future stock price of the company based on various financial statements. The goal of Fundamental Analysis on Stocks is to identify how healthy the company is? How much potential does company has to outperform in future? There are various different financial ratios that can be used to measure the performance of the company. In this tutorial we will let you know the different types of financial ratios which will assist you to analyze the stock. For example: If you want to identify the performance of company’s assets, you can evaluate based on Return on Assets (ROA) ratio. Likewise there are many different types of financial ratios to identify the performance and strength of the company. One of the recommended way to evaluate performance of the company is through comparing the financial statements or ratio with other companies of same sector. For example: If you compare technology sector company like Infosys, then its Profit Earning (P/E) ratio would be much higher than any of the banking sector companies. So it should always be compared with same sector company. Let’s take another example, the right way to compare potential of the company is to evaluate from same industry. Like to measure performance of State Bank of India, we will compare the ratio and financial statements with either ICICI Bank or HDFC Bank. After you have done analysis on intrinsic value, performance of the stock. Next step is to build the strategy for the right time to buy the stock of the same. Below listed points to be taken care of when you thought of investing capital. Once you have selected the stock, do not jump into stock right way. Tack two stocks from the same sector for at-least 3 months. Keep the record, Identify the recent lowest level of the stock from last 3 months data. Upon then, at the nearest lower levels you can think of investing your capital into particular company’s stock. Since now you have evaluated the ratios and other financial data of the company. Make a note of it, keep the copy of it, and keep reviewing ratio periodically. This will assist you in evaluation whether your estimated value was calculated correctly or not. Whenever you analyze any of the stocks ratio or financial statement, try to compare those fundamental analysis data with reputed brokers or trader’s data. Get prepared mentally that your evaluation to identify and pick the correct stock was right or wrong with the top investors of the stock market. Create the benchmark to always compare your evaluated data with the successful investors. This will help you become a successful investor through fundamental analysis of stocks.